Nature is kind to some, and not so merciful to others. Much of what happens to us on a daily basis stems from chance, and almost every evening I try to reflect at least briefly on my good fortune to have experienced another day with my family, friends, and patients, knowing that it can all change so abruptly. In order to understand the wonder and tragedy that lies within the following anecdote, it is necessary to understand some of the basic vascular anatomy of the brain – the plumbing that enables blood to circulate, that sustains the function and viability of the organ that makes us who we are. 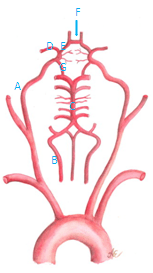 There are typically four arteries that bring blood to the brain – an internal carotid artery on each side (A) and a vertebral artery on each side (B); the vertebral arteries join together to form the basilar artery (C), which supplies blood to the brainstem and the back of the brain. The major arteries that extend from the internal carotid arteries in the brain are the middle cerebral arteries (D), and again, there is one on each side. The middle cerebral arteries supply blood to approximately 2/3 of the cerebral hemispheres. Smaller arteries supplying the inner midline surfaces of the brain also arise from the internal carotid arteries, called the anterior cerebral arteries (E). In the majority of people, there is a bridge connecting the right and left anterior cerebral arteries, called the anterior communicating artery (commonly called the AComm, F). With the AComm comes a connection between blood flow going to the right and left sides of the brain. I have seen patients arrive with completely blocked carotid arteries and absolutely no symptoms, and when evaluating cerebral blood flow with ultrasound or with angiographic imaging, it is clear that the side of the brain with the carotid artery occlusion is borrowing blood from the other side, using what is called collateral flow. There is also the potential for sharing blood between the front of the brain and the back, via posterior communicating arteries (PComms, G, potentially one on each side). A complete circle in patients with both an AComm and PComms in addition to the other normal arteries in the brain is known as the Circle of Willis. About 30% of people possess a complete Circle of Willis. During a weekend when I was on call, a previously healthy man in his 40s transferred from an outside hospital for management of an extensive right hemispheric ischemic stroke. He was critically ill upon arrival with an extremely concerning neurological exam. His angiographic imaging (imaging of his arteries) revealed that he had a right internal carotid artery dissection (essentially, tearing of the inner lining of the artery) with thrombus (clot) obstructing flow. His right hemisphere was ischemic, and he was unable to generate alternative ways of obtaining blood flow to this region in his brain. He lacked a complete Circle of Willis – no AComm and no PComms. I find that certain days exist in which neurological themes declare themselves. On some days, I will see four patients consecutively who all have atrial fibrillation, an irregular heart rhythm that can result in ischemic strokes. On other days, I may receive three referrals for stroke that occurred during pregnancy or in the postpartum period. On that particular weekend, though, the theme was clearly carotid artery dissections. As I was leaving this man’s room in the neurological intensive care unit, the ER paged me, requesting guidance on a woman who had arrived with drooping of an eyelid (ptosis), and her pupil on the same side was more constricted than in the eye on the other side. This sounded like a classic Horner syndrome. Horner syndrome can occur with an injury to the internal carotid artery, which can result in both of the findings mentioned as well as abnormal sweating on the affected side of the face. I recommended that the patient have a brain MRI along with an MR-angiogram of the head and neck to exclude the possibility of a carotid artery dissection, a potential cause of Horner syndrome. I received a page soon after this that her imaging was, indeed, consistent with a significant carotid artery dissection. Fortunately, there was no stroke present. Aside from the eyelid droop and abnormally sized pupil, she was completely neurologically normal. Her MR-angiogram of the brain revealed that she possessed something valuable that the first patient lacked – she had an AComm. 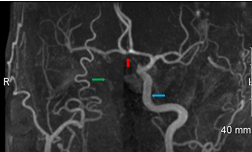 The blue arrow delineates flow in this patient’s normal left internal carotid artery. The green arrow demonstrates the absence of blood flow in the right internal carotid artery. The red arrow identifies the AComm, connecting the left (normal) circulation in the brain to the right side, and enabling the patient to avoid a stroke. When I evaluated the patient in the ER, she told me that she became concerned about the abnormal appearance of her pupil, and had decided to seek medical attention for this in the ER rather than waiting until Monday to talk to her primary care provider. She was started on antiplatelet therapy for stroke prevention, and did not sustain a stroke. Nearly one year later, her Horner syndrome has improved (although not completely resolved) and she is doing well. I am convinced that carotid artery dissections are underdiagnosed. Frequently, these patients present to the ER or to their primary care providers with headaches that seem like migraines at first glance. Perhaps a head CT scan is performed, which is not an effective study for excluding ischemic stroke (especially very early stroke). A brain MRI is a more sensitive tool for identifying early ischemic stroke, but if a carotid artery dissection is present, this will only be seen on a brain MRI if the dissection is located close to the brain and is large. If the dissection is small, or located farther down in the neck, a brain MRI will miss it. If a patient seeks medical attention for a severe headache unlike any other previously experienced, a migraine that differs from the patient’s description of his/her typical migraines if the person is already a migraine sufferer, or if the patient has any associated neurological symptoms involving the face, eyes, speech, or extremities, a brain MRI along with some sort of imaging of the arteries in the head and neck should be performed. I reflect back on the ironic juxtaposition of these two patients presenting on the same morning, and marvel at what a difference the presence of a tiny artery in the brain can make. In this case, it was the difference between returning to a good, normal life without stroke, and tragically in the first patient’s case, an untimely death. He passed away within the week, despite the intensive medical care that he received. I have often wondered if I have a complete Circle of Willis. Do I have an AComm? I don’t know. I do not have an answer, and perhaps I will never seek one, because what is up there is working for now, and I cannot change what I have. Certain cards are dealt to us long before we ever take our first breaths in the world, and as much as we like to feel empowered to create our own destinies, we do not have a say in whether our Circles are complete or not. Stroke brings the realization of a loss of control, and with this comes fear and anxiety. Stroke is more than just a diagnosis with symptoms. But when I see a patient with a carotid artery dissection and an Acomm providing flow, I see perseverance, and it gives me pause. I have a Left Internal Carotid Artery Dissection and my circle of willis is complete! I have good days and bad but the good seem to out number the bad. Thanks so much for this blog—there are not many doctors out there that “understand” us with dissections. Thank you Dr. Dodds. Thrilled to see you are educating the public on carotid dissections. I had a spontaneous extracranial dissection while running with resulting aneurysm/Horners Syndrome and was given an initial diagnosis of a viral ear infection. This is an under-diagnosed condition and I feel fortunate to have been referred to a Neuro interventionalist who listened and helped me. Unfortunately it took my sister’s sudden death from a ruptured cerebral aneurysm for my symptoms to gain the attention needed 10 months after my initial “event”. I would welcome more info on the correlation between dissection and the physical exhaustion experienced for months afterwards without evidence of a full CVA. My symptoms have mostly resolved after stenting 20 months post CAD. I realize how fortunate I am. I’m so glad this page was started….This totally hit home with me. My ex primary care did the whole misdiagnosis after going in with a severe headache and telling him how I had lost vision in my left eye half way up and half way in. He never checked my eye and sent me home with Tramadol, saying it was from my allergies. Spent the weekend in bed with an excruciating headache. Went to see my opthamologist on Monday, he was the one who said it sounded like a TIA and I should go to the ER. Was diagnosed with LICAD. Two weeks later was having several TIA’s throughout the day. Admitted again to the hospital and a stent was put in. Six weeks after that another stent and stroke. Have minimal deficits, thankfully. I feel very blessed that things were not any worse and my neurologist and neurosurgeon are amazing! Great blog post! Thank you Dr. Dodds! I enjoy reading these and learning about various populations of people who have strokes and learn so much about strokes, treatment, and the brain at the same time. Thank you again! I love you put this blog together for our learning and inquisitive minds. Thankyou for this article. I had a bilateral CAD and subsequent stroke 6 years ago. I am fine now thanks to my perfect circle of willis even though one carotid is permanently closed. I have a very strong family history of cerebral aneurysms. Surely there is a connection? Dr. Doses, I enjoyed reading your informative post. My husband had a left carotid artery dissection and unsuccessful thrombectomy attempt. The only trigger that we can identify is his having a severe cough for several weeks prior. In your practice have you seen patients whose dissection was triggered by a bad cough?